In May 2016, the Expo Line opened. 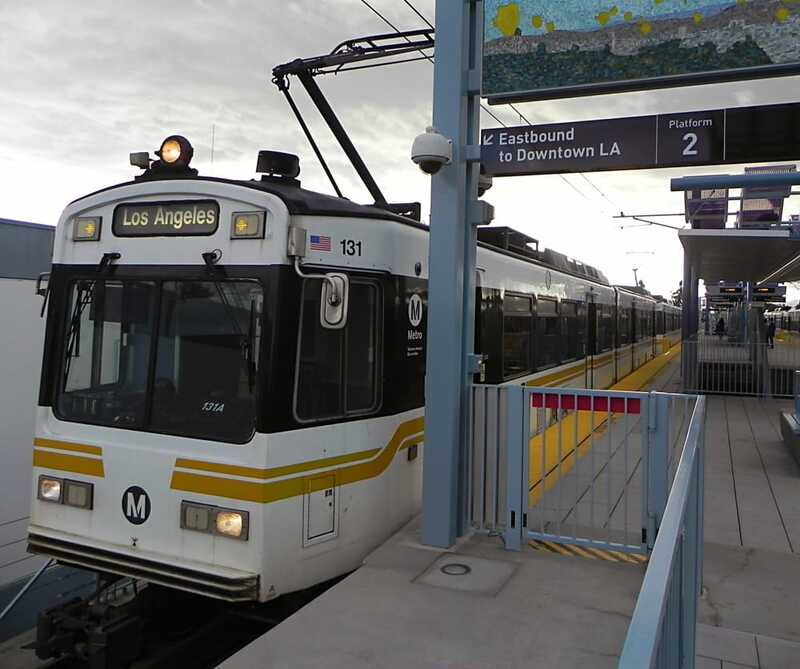 The Expo Line is Los Angeles’ long-awaited metro line running from Downtown LA to Santa Monica. From one end to the other, the metro will take forty-seven minutes to cross the city. Of course, it could be faster at times to take a car, but if you take the metro, you can sit back and relax, send emails and watch the traffic as you pass by. Or, you can hop off and on the metro as you visit wine bars along the Expo Line. No matter whether you start from Downtown or Santa Monica, there are wine bars within walking distance from six of the eighteen stops along the Expo Line. So grab your walking shoes and your Tap Card and start drinking! Los Angeles wine tasting by train, what could be less likely and more fun than this. There are four wine bars within walking distance to the first stop on the Expo Line. We start our Los Angeles wine tasting adventure here. A short four-minute walk (.2 mile) from the 7th Street/Metro Center stop is the underground wine bar D’Vine Wine Cellar. Located below the O Hotel, the wine bar shares an entrance with the nightclub Honeycut. Head down the stairs and go left for music and cocktails and right for wine and food. The wine list is international with fifteen red wines and eleven white wines by the glass. New wine director Killian Trehoux has recently arrived from France so expect to see a possible French wine focus on the list. Wine flights are available for $16. A thirteen minute (.6 mile) walk from the metro is the quaint neighborhood spot, Mignon, located next to Cole’s, home of the original French dip. The warm, inviting wine bar is dominated by an eighteen-seat bar in the center of the space. There are also two two-top tables by the door. The weekly changing wine list is eclectic and interesting with a sparkling refosco from Slovenia, godelia from Spain and other tasty wines from Italy, Austria, France, Germany and New Zealand. Mignon also has sherry, port, cider and dessert wines by the glass. A menu of salads, charcuterie, cheese and other small plates is available. Wednesday night is flight night where you can get 3 ½ glasses of wine for $15. Located only three minutes (.2 mile) from Mignon, or eleven minutes (.5 mile) from the metro, Garcons de Café is located in the Spring Arcade building, a glass enclosed space that runs between Spring St. and Broadway that currently houses a few restaurants with more on the way. Garcons de Café is a charming French marketplace and lounge. French owners Sofian Ketfi and Thomas Choulot met in Africa and with a shared love of wine, came to Los Angeles to open their wine bar. The wine selection, which changes weekly, is exclusively French and features primarily organic, small production wines. Full bottles of wine are also available for retail purchase. With a low markup, the wines are a great value which makes it no wonder why Garcons de Café is a popular spot for sommeliers to stop for a drink. In addition to wine, cheese and charcuterie are available, as are a selection of French-designed clothing and items that are on display. Not far from Garcons de Café (6 minutes/.3 mile) is Buzz Wine and Beer Shop, a fourteen minute (.6 mile) walk from the metro. Open late at night, Buzz offers a unique selection of wines and beers. And in the back of the store is a tasting bar with approximately forty wines by-the-glass. While Friday nights are the beer nights with the #TapTakeovers, Saturdays are for the wine lovers with #SaturdayNightFlights. Two stops past the 7th Street/Metro Center stop is the LATTC/Ortho Institute stop, in the heart of USC-land. If you get off the metro and walk straight for fifteen minutes (.7 mile), you will find Bacaro LA. Located in the heart of a college town, Bacaro LA is regularly frequented by USC students. An energetic, casual space, where the wine list is scrawled on the chalkboard walls, Bacaro LA features an international selection of boutique wines ranging from Georgia, Croatia, Italy, France, Spain, Chile and California. By ordering only one case per wine at a time, the list is constantly changing and a great opportunity to try new and interesting wines. Bacaro LA also offers a full brunch and dinner menu. Monday nights are “buy one, get one free” and on Wednesday it is “Wine Down Wednesday” where each glass gets $1 cheaper than the previous round. As you continue along the Expo Line, the Culver City stop will be the next stop with a wine stop. A thirteen-minute walk (.6 mile) from the Culver Metro is the modern-rustic-chic Bar and Garden. With exposed wood and plants and gifts lining the walls, Bar and Garden is a wine, beer and retail shop. All of the products in this shop are non-GMO, meaning no pesticides, no herbicides, no fungicides and no artificial ingredients are used in the making of the products. With a rotating stock, the boutique wines include many hard-to-find wines. While Bar and Garden is a wine retail shop, they do have a tasting bar in the back and offer tastings every Tuesday from 5-8pm and Sunday from 2-5pm. And on Fridays they host “Five for Five and Five” and you can taste five wines for five dollars starting at 5pm. Once you get to the Westwood/Rancho stop, the walk to a wine bar is a little further. If you do not feel like the walk, now may be the time to jump into Uber for a short ride. You’ve made it about half way through your Los Angeles wine tasting by train adventure. Located two miles south of the metro stop, Sara, The Wine Bar is a hidden neighborhood wine bar. Italian owner Sara has taken her mother’s recipes to create an Italian-inspired menu of small plates, such as charcuterie, cheese, caprese, polpettine, lasagna, and scampi diavola. The wine list is international with a few Italian selections. But the goal of the bar is to be warm and unpretentious, where friends can come and enjoy wine and food. Happy hour is daily until 7pm. One stop past the Westwood/Rancho stop is the Expo/Sepulveda stop, just next to the 405 Freeway. Seven minutes (.3 mile) from this stop is The Wine House, one of the largest retailers in Los Angeles. With a vast range of wines and spirits, sometimes it is hard to choose a wine. Luckily, The Wine House has an automated in-store wine tasting area. With enomatic machines, they are able to offer thirty-two different selections. Activate a card and try as many wines as you like. The tasting room is open Monday – Saturday from 11am-6pm and on Sunday from 12-5pm. One-ounce tastes of wine range in price from $1.50 to $8. Where else can you taste the 2012 Ornellaia “SuperTuscan” for only $8? The Wine House also offers many classes, tastings and dinners throughout the year. The last stop of the Expo Line (or first stop if you start in Santa Monica) is in Downtown Santa Monica, where there are many restaurants and retail shops in walking distance. A thirteen minute (.6 mile) walk from the metro stop is the brightly lit, open-space Esters Wine Bar, offering wine by the glass, small plates, as well as a retail shop selling bottles and gourmet snacks. Tucked inside a refurbished 1937 Art Deco building, Esters offers a beautiful large bar or a casual patio to enjoy a bite to eat with a glass of wine, classic cocktail or artisanal beer. Focused on small producers, the staff is educated about the wines and can talk comfortably about the wines. Esters offers a weekly Sunday Wine Tasting, as well as Winemaker tastings other nights of the week. A five minute (.2 mile) walk from the metro, and located on the top floor of the Santa Monica Place Mall, near the new Arclight Theaters, is our last stop on thsi Los Angeles wine tasting trail. Venokado is a wine and gift retail shop. Featuring small production wines that can be hard to find, all wines are available for purchase and can be opened and enjoyed onsite for an $8 corkage. Venokado also offers daily wines tasting flights. For $15 you can taste three wines, each valued under $20, or for $35, you can taste three wines, each valued over $40. While sipping wine, you will have a hard time not browsing all of the charming gifts items. If you are looking for that perfect hostess gift, try their signature Clutch Gifts which includes a bottle of wine and three or four goodies, such as chocolate, bath salts, candles, a wine opener, basically things you love in one. Read the original story at California Winery Advisor. This entry was posted in Lifestyle, Wine and tagged Bacaro LA, Bar and Garden, Buzz Wine Beer Shop, California Winery Advisor, D' Vine, Esters, Expo Line, Garcons de Café, Los Angeles Metro, Mignon, Sara, The Wine Bar, The Wine House, Venokado, Wine, wine bar, wine tasting by Allison Levine.